Prepared by the Bureaus of Human Rights and Humanitarian Affairs and of Inter-American Affairs. "Within the revolution, everything; against the revolution, nothing." The ordinary Cuban lives in an environment of repressive fear subject to constant state surveillance. Assembly. There are no guarantees for freedom of assembly or association in Castro's Cuba. Nearly all associations are government controlled. A few private associations still operate, but only under close government scrutiny. All group meetings are monitored by the Committees for the Defense of the Revolution or State Security. When the secretary of the Cuban Committee for Human Rights tried to legally register the organization last month, he was arrested and beaten. At last report.he was still being held. organizations-including the large union and peasant associations-is practically a prerequisite for any routine activity, since membership affects admission to universities, promotions, access to certain kinds of vacation or recreational activities, the obtainment of nonperishable products that require that a union certify that the buyer is an "advanced worker." Cubans are, therefore, compelled to ioin such organizations simply to obtain an education, earn a living, or support their families. The OAS report adds that it is difficult "to distinguish when the decision to join a people's organization reflects a desire to support the regime, and when it is a response to the material benefits ... which cannot be obtained otherwise." Political. Those who choose not to join government organizations or who are denied membership are not only economically disadvantaged but also effectively deprived of political participation. Political participation requires strict adherence to dogma. Cuban citizens do not enjoy the right to change their government. The Cuban state is firmly controlled by the Cuban Communist Party, which in turn is dominated by Fidel Castro. There are no direct elections for regional, provincial, or national offices. Members of the Central Committee and the Politburo are selected by a narrow circle of party rulers; elections simply ratify choices already made. The National Assembly of People's Power meets briefly twice a year-solely to endorse decisions already made by the party chiefs. No political opposition is permitted in Cuba; dissidents are either in jail or outside the country. There is no legal way for citizens to change the government. As a result, hundreds of thousands of Cubans have fled their country, and many others would do so were it not dangerous. Press. There is no freedom of press in Cuba. All media outlets are controlled by the state, operate strictly according to party guidelines, and are used for indoctrination and dissemination of propaganda. Foreign publications- except those from other communist countriesare not available. The government censors all news, international and domestic. Unfavorable news, when reported, is often delayed. Almost all news is distorted. Travel of foreign reporters to and in Cuba-as well as their access to the public and officials-is strictly controlled by the government. Artistic. There is no artistic freedom in Cuba. Many of Cuba's most distinguished literary and artistic figures have been "erased" from cultural outlets and broadcasts. Writers and artists have been under severe constraints since the beginning of the revolution, when Castro made the following statement about artistic freedom: "Within the revolution, everything; against the revolution, nothing." The National Union of Writers and Artists of Cuba, modeled on the Union of Soviet Writers, controls virtually all literary and artistic expression. the block committees and the omnipresent State Security. Punishment is severe for writing or possessing unauthorized literature. Artists and writers who attempt to step outside these constraints pay heavily for their exercise of artistic freedom. Many are imprisoned and tortured. Forced renunciation of one's artistic works-obtained through physical or psychological coercion, including threats against one's family-is another technique used against artists and writers. The lack of political content in their writings does not serve to protect authors. It is not enough in Cuba that art be nonpolitical; it must also actively serve the revolution. Religious. Repression of religion in Cuba is thorough and pervasive. 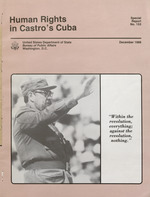 Religious broadcasts are totally prohibited (except for news of foreign clergy defending the Castro regime shown to prisoners of conscience to demoralize them). The construction of new churches is severely restricted. Those who try to maintain religious practice find innumerable roadblocks. Many churches have been closed; some have been desecrated. The few still open are closely monitored by block committees. Only about 200 priests remain in Cuba, compared to about 720 before the revolution. The observance of religious holidays is next to impossible, and the celebration of Christmas is specifically prohibited. Christmas trees, so common in Eastern Europe, are banned as counterrevolutionary symbols in Cuba, and the celebration of Holy Week has been replaced by a celebration of the failure of the Bay of Pigs invasion. Political meetings and work obligations are regularly scheduled to conflict with religious occasions, and Cuban law prohibits the observance of religious events when they conflict with work obligations or patriotic celebrations. Processions on holy days are banned. Parents of children who mention God to their classmates risk being reprimanded for teaching "unscientific"
The following report was prepared by the Bureaus of Human Rights and Humanitarian Affairs and of InterAmerican Affairs. When a former Cuban political prisoner-one who had served 27 years in Castro's prisons-arrived in Miami in September 1986, he made the following comment: "When they opened the gates we still felt like prisoners. In Cuba everyone's a prisoner." Life in Cuba today is characterized by an aggressive, systematic, and instiStutionalized denial of human rights in ~, virtually every form. The Communist Party, tightly controlled from above, dominates all aspects of life. Human rights of Cubans are subordinated to the aims of the party as defined by Fidel Castro. Daily life is closely monitored by these committees, which exist on practically every block in Cuban cities and towns. Committee membership is essentially mandatory. Members are expected to observe and report anything "unusual," including strangers in the neighborhood, reception of foreign radio and television broadcasts, unauthorized meetings, or critical comments about the government. are unable to advance because there is a political test" for promotions. Proof of ideological soundness is required before the purchase of durable consumer goods and sometimes for housing. nity also face ob and educational discrimination and are severely restricted in attempts to pass on the faith to their children. denominations-have been singled out for additional punishment. The SeventhDay Adventists, Jehovah's Witnesses, and the Congregation of Gideon are considered counterrevolutionary sects. Those discovered engaging in religious practices are treated as criminals. Many from all faiths have been arrested, abused, tortured, and even executed because of their religious beliefs. In a 1985 book entitled Fidel and Religion, and at the February 1986 Third Congress of the Cuban Communist Party, Fidel Castro acknowledged that discrimination against Cuban religious practitioners exists. There is no evidence to date that religious discrimination and persecution have been mitigated despite speculation that Castro, for foreign or domestic political reasons, might be considering some relaxation of pressure on believers. government-run education. Parents cannot choose independent schools for their children; there are none. Schooling is compulsory from grades one to six. After the sixth grade the right to remain in school is tentative and based ulti-. mately on loyalty to the regime. The price for expressing an opinion in school can be extremely high. Faced with such a "choice," most 11-year-old children naturally submit to the routine of Young Pioneers meetings, neighborhood guard duty, compulsory rural labor, and other forms of regimentation. Many students over the age of 11 are housed in dormitories from Sunday night to Friday night and go home -only on weekends. This boarding system, mandatory for many high school and junior high school students, is intended to drive a wedge between child and parent and turn the child's sense of duty toward the state. Dormitory living conditions are often poor, with old wooden barracks, primitive sanitation, poor health care, and harsh working conditions. The weekly curriculum includes 30 hours of classes (with heavy ideological content) and 15 hours of picking crops in the fields. A student's educational opportunities depend not only on his own political record but the political reliability of his parents as well. Children of political prisoners are notified that they will never receive advanced education. Students do not choose their own careers; the choice is made for them, depending on the needs of the state. Economic. The right to choose one's occupation is practically nonexistent in Cuba. Priority is given to collective or state needs over individual choice in state decisions to provide employment. weekends. Self-employed people are. generally required to have state employment as well. Castro expressed concern that the government was losing money because tenant farmers and sharecroppers unregistered with the state were selling produce on the open market. In 1983, 200 farmers refused to sell their crops to the government because it demanded a price lower than the cost of growing them. (The government also had refused to allow them to retain a small amount of crops for personal consumption.) In protest, the farmers burned some of their crops in front of a government warehouse and were arrested. Reports from several sources indicate that 11 of the farmers were sentenced to death and shot. More recently, Castro has denounced farmers markets and other individual or group initiatives as manifestations of corruption or decadence, again demonstrating how risky it is to engage in private enterprise. The state controls organized labor. Nearly all workers belong to the government-run Confederation of Cuban Workers, which serves primarily to maintain political and work discipline, spur worker efforts and productivity, and hold down labor costs. The confederation does not defend workers' rights or fight for benefits. The recent calls by Fidel Castro for greater work "discipline" characteristically have come in the framework of trade union meetings where he and so-called labor leaders harangue the workers to be more diligent. Collective bargaining does not exist. Management, in the form of the Ministry of Labor, and the government-run union cooperate to maintain careful supervision. Workers who believe they have been unfairly treated have virtually no recourse. The right to form an independent union is unthinkable. Even discussing such a step is severely punished, as demonstrated in 1983 when the government accused five Cuban workers of "industrial sabotage" for talking with their colleagues about the need for an independent union. The government sought the death penalty, but the judge sentenced them to prison. Castro demanded they be tried again by a different judge, who sentenced them to death. International outcry resulted in eventual commutation of their sentences to 30 years of imprisonment. The first judge, Nicasio Hernandez, was imprisoned for an indefinite term, as were four of the defense lawyers (Jose Redell Soto, Abelardo Triay, Valdez Arnau, and Felix Casuso). They were sentenced to die, but their sentences also were commuted. Three other lawyers associated with the case (Aramis Taboada, Francisco Morua, and Israel Tamayo) were sentenced to 30 years in prison. Taboada died in prison in 1985 under unexplained circumstances. Other workers have been arrested for discussing the formation of an independent union, including 30 truck drivers at the Central Chaparra sugar mill, workers in a Havana electrical plant, workers at an Artemisa brewery, and farmers in Menocal-three of whom were shot during arrest. In Cuba, contrary to Marxist theory, state control of the economy does not mean control of the economy by the people. Nor does it mean that an upper class is nonexistent. The party leadership controls wealth and power but in a much more concentrated, centralized, and unchallengeable form than any "capitalist" could ever hope to achieve. to purchase jewelry and expensive clothing from stores designated for their exclusive use. They have access to private beaches and, unlike most Cubans, may travel abroad. They live in homes confiscated from Cuban citizens who fled the country. The Cuban economy is still based primarily on sugar; it is even less diversified than it was before the revolution. Notwithstanding plans for industrial development, manufactured goods accounted for only 5117o of Cuban exports in 1980; in 1960, the figures were the same. In contrast, other Latin American countries had substantial increases in the export of manufactured goods during the same 20 years. Agricultural production is generally down from prerevolution levels-even though the population is 50% larger. widespread, has not guaranteed that food will be available. Despite increased beef and poultry production, for example, each Cuban is allotted only 2 pounds of meat and 11/2pounds of chicken per month. Added to the food shortage is the scarcity of consumer goods and the low per capita income. In 1958 Cuba was fourth in the hemisphere in per capita income; now it ranks sixteenth. Although much has been made of advances in health care claimed by the Cuban Government, severe sanitation problems still threaten Cuban health. Inadequate control of mosquitoes together with the return of thousands of soldiers from Africa have led to several dengue fever epidemics. Castro himself has severely criticized conditions in Cuban hospitals. Housing also is deficient: nearly onequarter of Cuba's 10 million people live in inadequate housing. and cruel and inhuman punishment. People often are arrested without warrants and held for long periods without judicial hearings. The Cuban Constitution denies legal -protections that would prevent the regime from arresting and detaining anyone considered harmful to Castro's revolution. People arrested for vandalism, practicing certain religions, or criticizing the regime can be charged with sabotage and counterrevolutionary activities. Detention is permitted for those considered "dangerous," defined as "the special proclivity of a person to commit crimes, demonstrated by observed conduct manifestly contrary to the rules of socialist ethics." Cuba includes in its definition of "crimes" acts that no free society would consider as such. The treatment of political offenders at every step of the process is unrelentingly severe-preventive detention, house arrest, forced psychiatric treatment, confinement in forced labor camps, and imprisonment. Arrestees are interrogated without counsel and subjected to methods of intimidation designed to force confessions. The political detainee may be kept incommunicado for days or weeks without being charged and without notification of family. with political offenses, as the case of the late Aramis Taboada illustrates. A trial normally consists of evidence presented by prosecution witnesses (generally members of State Security). There are usually no defense witnesses. If a member of a block committee testifies for someone in a criminal matter, that person usually gets a reduced sentence. Political trials generally last from a few hours to a day, even in cases where long prison terms are at stake. Reports have reached the OAS that in one case a trial lasted no longer than 10 minutes and that political trials never last longer than 3 days, including announcement of judgment and imposition of sentence. political trials. The pressures on judges to find guilt in these cases are strong, especially when party leaders appear to denounce the accused. Fidel Castro and his brother Raul have been known to appear at trials to denounce prominent persons accused of political offenses. As the OAS report stated: "Such strong pressure ... excessively influences the administration of justice, and leaves it no alternative but to endorse the verdict of the political leadership.. . The report added: ". . the evidence would indicate that the sentences have always been fully in accord with the Executive's idea of proper justice." reserved for the plant ados, as those political prisoners who refuse "political rehabilitation" are known. They spend their days dressed only in pajamas or underwear or without any clothing at all. Visits by friends or relatives are limited to one or two per year, or less, and letters to one per month. Political prisoners are not routinely released at the end of their terms. Their freedom depends on a personal decision by Fidel Castro, who has frequently used the release of political prisoners to gain favor with an influential foreign visitor or to put the latter under obligation to ''respond.'' Sentences are often extended without any trial or due process. Plantados are especially likely to be forced to remain in prison after expiration of their sentences. There are reports that these prisoners are subjected to particularly harsh conditions, especially those in Boniato Prison. political offenses at the age of 12 to be imprisoned until the age of 21. Although his sentence expired in June 1971, he has been forced to 'remain in prison ever since. His only moments spent outside prison were in June 1984 when he was subjected to the psychological torture of being put on a bus of freed prisoners bound for the United States only to be removed at the last minute. Torture and mistreatment continue today. In April 1986, a dozen former prisoners testified before an international panel in Paris about additional examples of torture and inhuman treatment. Ana Lazara Rodriguez cited cases of guards throwing women down stairs and kicking them in the breasts and stomachs. Raoul Carmeante reported that 15- to 18-year-old boys were put in prison barracks with sexual degenerates who raped them repeatedly. Eduardo Capote showed the panel his hand where one of his fingers had been chopped off by a prison guard. went mad and "almost every day a prisoner committed suicide." Mrs. Mayan observed: "If anybody says that all happened years back, I am here to tell them it is still happening." Once political prisoners are freed, they are sometimes forbidden to leave Cuba. Ricardo Bofill Pages, chairman of the Cuban Committee for the Defense of Human Rights, was released from his third term in prison in August 1985 but still awaits permission to depart the country. In August 1986, following the arrest of five members of the committee, Bofill-fearing a fourth prison sentencetook refuge at the French Embassy in Havana, where he remains today. former political prisoners sometimes are denied the right to work, possess ration cards, or obtain basic identification documents. They are subject to discriminatory treatment for the rest of their lives. They must live with constant surveillance and social ostracis m.
once numbered many thousands, amount to about 200. . ." Castro, who has no reason to exaggerate, also stated that the total number of individuals "sentenced for counterrevolutionary activities" could be as many as 1,000. Americas Watch and Amnesty International have published estimates that the number is between 250 and 1,000. The Cuban Government no longer distinguishes political from common criminal prisoners. Many persons have been imprisoned for acts that are attempts to resist or flee an oppressive regime. Thus some former political prisoners who contend that the total number of political prisoners is, in fact, nearer 10,000 may well be correct. A 1985 survey by Amnesty International of other human rights organizations drew responses indicating that there may be as many as 15,000 political prisoners in Cuba, though Amnesty International itself did not endorse that number. Few political prisoners have been involved in violence against the government. many of these brave people to their new lives of freedom in September 1986-. Executions for political offenses are still frequent in Cuba. Twenty-nine people were executed in October 1982 for "plotting against Castro." Among these was Armando Hernandez Gonzales whose "plotting" consisted of putting up anti-Castro posters and scattering some nails in the road to hinder trucks carrying people to Sunday "voluntary" labor. Several of his relatives were similarly charged and also executed at this time. In August 1983, John Olivera Alberto, a Jehovah's Witness, was executed for spreading propaganda inciting rebellion. Three other Jehovah's Witnesses-Jesus Prieto Suarez, Saul Pay, and Efrem Noriegas Barroso-were executed in October 1983 for possessing a mimeograph machine to reproduce religious tracts. Defense of Human Rights reported in 1984 that 37 people were executed by firing squads between October 1983 and May 1984. The same committee reported in 1985 that at least five young Cubans were executed in the first half of 1985.
in such matters. This was the third person killed at the Venezuelan Embassy in the preceding 22 months and the 21st killed there since 1974. Cuba still finds it necessary to use capital punishment for an extraordinary range of "offenses." No free society, and, indeed, few authoritarian ones, executes its young people for painting slogans on walls, preachers for passing out religious pamphlets, workers for putting up posters, or farmers for protesting a low grain price. Nor does a society having any claim to be just condemn to death workers for talking about a union, judges for refusing to give a stronger sentence, or lawyers for effectively representing their clients. Bureau of PublicAffairs ,.., .,.